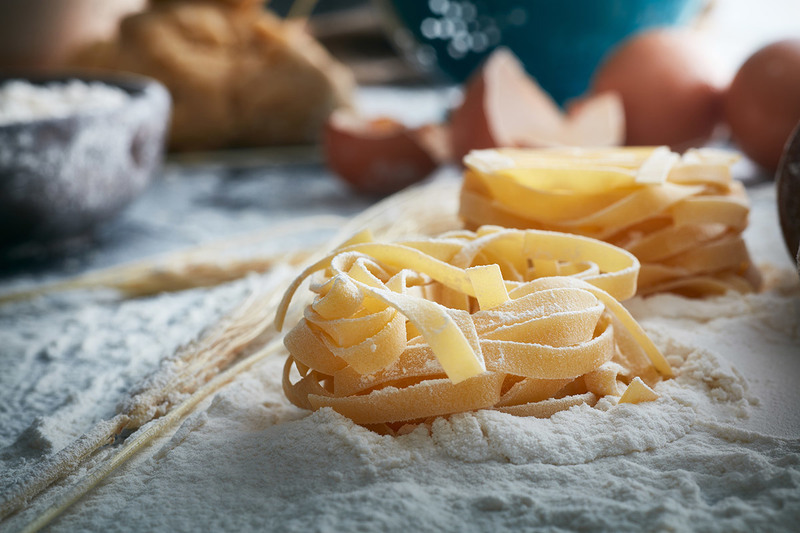 Perfect, handmade pasta isn’t as hard as it looks. With a little time and 4 ingredients, anyone can make pasta from scratch. Pour 2 cups of the flour onto a clean work surface. With your fingers, gently make a well large enough to hold the eggs in the center of the mound. Crack the eggs into a large measuring cup. Add the oil to the measuring cup, gently whisk together with a fork, and then pour the mixture into the well. Using the fork, draw flour into the egg mixture gradually until a shaggy mass forms. Use your hands to form the shaggy mass of dough into a ball. If when the flour on the work surface is all combined, and the dough is still sticky, sprinkle more flour until it loses its tackiness. Scrape the surface of the table to clean, then dust with flour. Place the dough on the surface and begin to knead. Use the palm of your hand to push down and away from you in the center of the ball of dough, turning it at the same time. Repeat until the dough is smooth, about 7 minutes. Shape the dough into a cylinder approx. 6 inches, tucking the edges underneath tightly, set a bowl on top overturned and let the dough rest 30 minutes and up to 4 hours. Cut dough into 6 equal wedges, remove one and cover the rest. Dusting gently with flour, press the dough into a 3 inch square. Use a rolling pin to roll from the center away from you, then from the center and towards you. Lift the dough occasionally to make sure it doesn't stick, and flour the surface if necessary. Roll until the dough is approximately 12 inches long, sprinkle with flour again and roll until the dough is 20 inches long and 6 inches wide. Place on a clean kitchen towel to dry slightly. Fold dried pasta sheet in about 2 inch segments, and then cut into ¼” noodles. Unroll the noodles and place scattered on a baking sheet. Cook within one hour, or freeze and then later cook from frozen. Cook pasta in salted water for about 3 minutes, until al dente or slightly firm. Popular in the late 17th century, Switchel is a drink made with ginger and sweetened with maple syrup or honey. When you’re in the mood for a homemade salsa, this restaurant-style recipe will do the trick!